As I worked on my computer this morning, my husband and our good friends worked cattle. My husband taught their kids how to show their steers for the fair this summer. In turn, they helped us plant new windbreak trees on our farm later in the afternoon. Today’s give and take among friends got me thinking about all of the ways friends help us out. Not only do we perform kind acts for each other, but there are monetary benefits of having friends too. In the past, when my kids were young, we often traded childcare duties with friends. Of course, this was very helpful for date nights with our spouses. We didn’t just use it for romantic evenings, though. When emergencies came up, our good friends were there when our families were too far away to help. But no matter the circumstances, having good friends prevented us from hiring a sitter many times. This saved us money at a time when we didn’t have a lot. If your budget is also tight, try trading with friends when you need a helping hand with your kids. 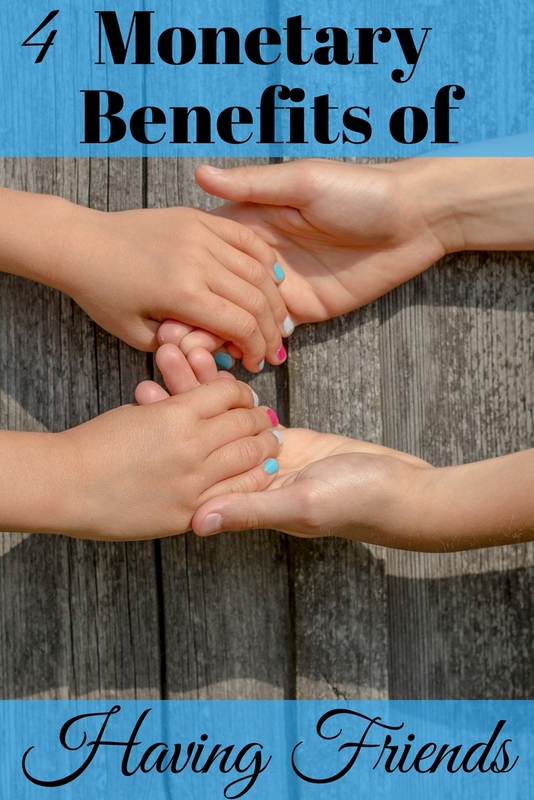 Not only will it help your finances, but it makes your friendships much stronger. Another of the monetary benefits of having friends is when they help move large furniture. In the area where we live, furniture is not always delivered free to our home due to distance. This means it must be moved on our own. Many times we have traveled several hours to and from the city to buy needed furniture items. Since choice it limited in our small town it is not unusual to do this. Unfortunately, once we arrive at home, there are no strong young workers there to unload for us. That is when good friends come in handy. In addition, they save us from having to find and hire other help on short notice. When you need help unloading furniture or other large items you can call friends to help out. They can save you a bundle and are usually willing to help with a smile. There are monetary benefits of having friends you can seek for professional advice. They can even prevent you from having to hire other professionals. For example, when my children were toddlers, I had a close friend who was a nurse. On a couple of occasions she saved me from paying unnecessary medical bills when I thought my child was ill.
As it turned out, I was just a nervous parent with a colicky baby. Thankfully, I sought her opinion before spending money needlessly and embarrassing myself at the doctor’s office. Having friends that can do nursing or other professional services allows you to barter and save money. One of the other monetary benefits of having friends is buying food items together in bulk. When you are trying to save money on groceries this is one tactic that can really help. We raise our own beef and have it butchered and processed nearby. This saves us a ton of money, but we still have to buy chicken from the grocery store. Sometimes a large package is too much for the two of us. But I can still buy it for a good price. Then I just split it and the cost with a friend or family member. I also buy vegetables in bulk since I don’t have time for a garden. Then I cut them up and freeze them for future casseroles, soups, and stews. You can maximize your food savings the same way. Just purchase groceries in bulk and split it with friends or relatives. It’s true that sometimes friends cause us to spend more money instead of less. But they can also help us to save in many ways as well. Try some of my ideas to save money in your budget and help your friends out too. What monetary benefits have you enjoyed just from having good friends?